Tyrosinase enzyme is the most important enzyme in melanization. It changes dopa to dopaquinone and eumelanin. Topical application of tyrosinase inhibitors is the most widely use method. Eventhough there are many new chemical agents claiming to be effective bleaching agent, hydroquinone(2-4%) is still the most widely prescribed topical bleaching agent. Hydroquinone usually result in short term improvement between 30-40% has total clearing within three months follow by recurrence. Long term maintainance with even 2% hydroquinone relates to many side effects e.g. skin irritation, hypopigmentation, rebound hyperpigmentation and ochronosis. Other newer agents include, kojic acid, arbutin, licorice , ascorbic acid, fullarine etc are less effective than hydroquinone. In order to enhance effectiveness of hydroquinone, it has been combined with retinoic acid(0.05%) and steroid(0.1% dexamethasone). This formular which is known as Kligman’s formula enhance effectiveness to>60%of cases have total clearing but also increase side effects especially skin irritation, dryness, acneiform eruption, rosacea-like dermatitis, skin atrophy and telangiectasia. Many patients develop steroid dependent rosacea-like facial dermatitis after prolong application. For mild to moderate epidermal melasma, 15-22% fat soluble ascorbic acid(e.g. Ascorbyl Phosphate Palmitate Sodium) or 7% alpha arbutin has been shown to be safe and effective treatment without side effect of hydroquinone. Mixed and telangiectatic type of melasma only partially response to topical treatment due to persistence of dermal melanophages. Recent application of repeatitive sub-threshold pulse Q-switched Nd:YAG laser has shown suppression of tyrosinase as one of possible mechanism of action. This is possible by superficial peeling which can be done by repetitive peeling of keratinocytes. This interferes with melanin transporation, enhance desquamation and reduction of hyperpigmentation. Retinoic acid(0.1%), glycolic acid(30-50%), and salicylic acid(20%) work on this principles. The clinical effectiveness of superficial peel for melasma is only mild to moderate. Periodic peelings are necessary to sustain the result. This often increase side effects especially skin irritation. Better result is obtained if peeling has been combined with topical bleaching. 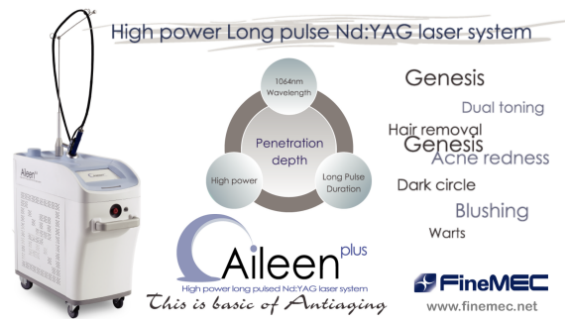 Repeatitive pulse Q-switched Nd:YAG laser also peels the superficial layer of keratin. Eventhough the reported result of treatment of melasma with dermabrasion was good. This treatment did not gain widely acceptance. The prolong post operative downtime and risk of complications had discourage both patients and doctors in performing this operation. Carbondioxide laser resurfacing had been studied in melasma with poor result and unexceptable side effects. Intraepidermal laser resurfacing ended up with severe post treatment hyperpigmentation while deep resurfacing down to mid dermis ended up with persisted hypopigmentation. Erbium Yag laser resurfacing had been studied with similar result. Intense pulsed light works by production of epidermal necrosis form absorbed light that had been converted into heat. The effects are similar to intraepidermal laser resurfacing. Post inflammatory hyperpigmentation and persistent hypopigmentation were common especially in dark skin types. High energy pigmented selective laser which destroyed pigmented cells by “Principle of Selective Photothermolysis” e.g. 694nm, Q-switched ruby laser, 755nm Q-switched alexandrite laser, 532nm Frequency–doubled Q-switched Nd:YAG laser and 1064nm Q-switched Nd:YAG laser had been studied for treatment of melasma with poor results. Balance normal skin colour was rarely achieved. During treatment with high energy fluence almost all epidermal melanins containg cells, e.g. epidermal melanocytes and keratinocytes will be destroyed. Melanocytes with early stage of melanin formation (Stage I-II) and follicular melanocytes will survived. Clinically hypopigmentation followed by hyperpigmentation is normal finding after this treatment. However some studies had demonstrated better result after combination of pulsed CO2laserandQ-switchedalexandritelaser.Thissupporttheimportantoffollicularmelanocytesassourceofrepigmentationofmelasma.TheauthorhadintroducednewtechniqueforQ-switchedNd:YAGlaserusingsubthresholdfluence(2.5-3.4J/cm2)10passeseveryweekswithfairtogoodresultin66%ofcases.Thetechniquehadbeencalled“subthresholdselectivephotothermolysis” or “laser toning”. This laser delivers pixel of laser beam producing microtermal necrotic zone(MTZ). Originally laser was diode laser but other lasers have been introduced to produce similar result e.g. carbondioxide, Erbium glass. Generally energy of laser pulse is between 8-10 Joules/cm2with1-2000MTZ/cm2. Preliminary data from uncontrolled study has shown fair to moderate result in treatment of melasma in Fitzpatrick skin type II-III. The mechanism of pigment lightening may be explained by partial destruction of epidermal melanocytes and transepidermal elimination of dermal melanophages. In dark skin type postinflammatory hyperpigmentation is not uncommon. For refractory melasma with telangiectasia and vascular proliferation, treatment of microvascular abnormalities are justified. Photothermolysis techniques using light laser have been used with fair to good result. The IPL(565-1200nm), Pulse dye(585nm), Copper bromide(577nm) had been used with fair result. 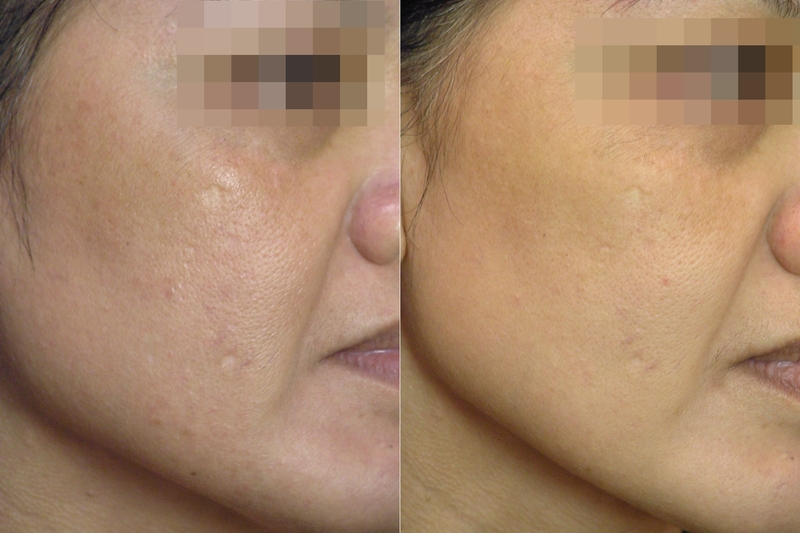 In treatment of melasma in Asian’s skin, these phothermolysis techniques resulted in photocoagulation of upper epidermis, scabbing and hyperpigmentation. Photocoagulation with long pulse Nd:YAg laser is a new alternative that has shown good result in a selected cases. Aileen(Finemec, Korea) is a new flat beam, high energy long pulse 1064nm Nd:YAG laser with cryospray cooling has been evaluated by the author for clinical application in melisma. Figure 2. Before and after 4 Aileen laser skin rejuvenation and tightening.